In which Ralph and Coralee write to their supporters about the state of the mission field after being on furlough for 14 months. We praise the Lord for a good and restful journey back to the field. All along the way the Lord wonderfully undertook. We thank you for your prayers. The ocean trip was the calmest we have ever had. Our ship accommodations were poor, but we had very good fellowship on board as there were more than a hundred missionaries going to all parts of Africa and the Middle East. In Egypt we had a delay of two weeks while trying to make arrangements to go on to the interior. The journey inland across the desert by train and then on the Nile steamers was tedious as there were a lot of changes. But we rested truly as we journeyed for the Lord's presence and help were very real to us daily. We arrived at Aba December 7th. Miss White our nurse had the lights on in our living room, and she and the natives gave us a very warm welcome. We had left our house furnished and she had used it as a guest house while we were away. She has kept it just as we left it. When we awakened next morning in our own beds amid familiar surroundings it seemed so natural that it was like a dream that we had gone to America. Miss White and the native nurses have done a fine job in the hospital. It has been precious to see how the Lord has blessed during this year away. We can see that many of the natives have grown spiritually. The Christmas season is always a busy time when all the Christians from the district gather here for special meetings. It was a blessed time spiritually, and a joy to greet many old friends. There were more than fifteen hundred gathered at the service on Sunday and again on Christmas day. Eighteen were baptized. We have been asked to take charge of the station and district work here temporarily, along with the medical work, until more workers are available. This seems to us a tremendous task. However the natives have learned to assume more responsibility during the shortage of workers, and they will be able to carry on some of the departments without a great deal of supervision. Miss Lutz has charge of the Girls' Home, and a native is in charge of the Boys' Schools of 400. Besides there is the Women's School; the Book Room and Printing Press which serve our whole field and neighboring Missions; the Carpenter Shop and the general workmen, and care of the station, the care of the Native Church, and the 70 Rural Chapels and Schools manned by native evangelists; and, with the able help of Miss White, the Dispensary and Hospital. Then, when able we are to visit seven other stations to supervise their dispensaries. These are scattered in three directions at distances up to 50, 160, and 500 miles. The task is far beyond us, and we are at the end of ourselves before we begin. And so we begin with Him. Pray that during the shortage of workers nothing will hinder His blessing here in the work. The opportunity is very great, but the time may be short. Pray for the salvation of souls, for the strengthening of believers, and for the much needed missionaries and native leaders. A recent War Bond poster entitled "He's in it up to his neck. Are you in it with him?" reminds us of our present position. The soldier is up to his chin in water, his hands holding his rifle up over his head. Our hands are up in prayer for the the Lord's help. Won't you "come in with us" by sustaining prayer that His strength may be ours in the task that lies ahead? We are thankful for you who pray and who have done so much for us during our furlough. You have refreshed us in the bonds of Christ Jesus. Letters from our girls, Edith and Esther, assure us that they are well and happy in their life at Hampden DuBose Academy at Zellwood, Florida. 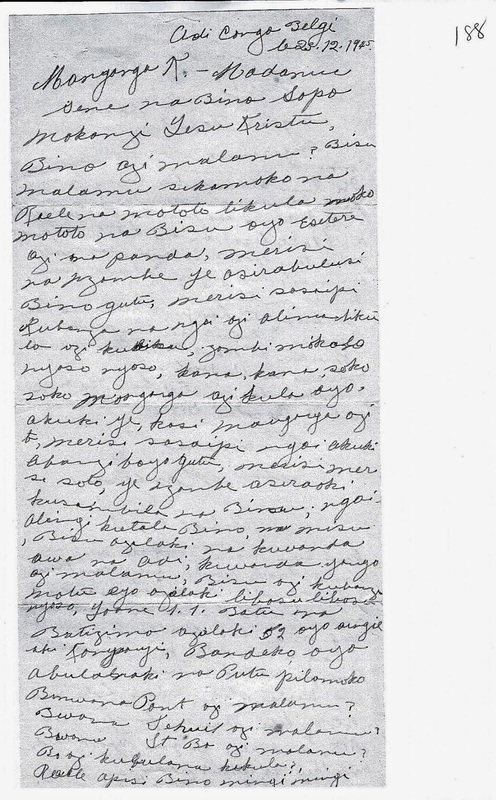 A Bangala letter and notes from Coralee, probably included with a letter to the girls. correctly again. Thanks, thanks, truly God has heard our (your) prayers. I want to see you again with my eyes. We had a conference here at Adi. It was a good conference. We are considering that person who was at the very beginning, John l:1. Those baptized were 52, those who joined the church. Those brothers who went to their home country like Mr. Pont (Pontier) is he well? Mr. Schuit is he well? Mr. St (Stam)are they well? Are they returning also? Raele (Rachel) sends you a lot (of greetings). I've been almost too busy to even pick flowers. Eleya Akulu has painted the cupboards and table (legs) in the kitchen a pretty green. They look nice and fresh now. Tomorrow I'm going to have them paint in there. The Scopelitis have just returned from Cyprus. I didn't see them yet. There are at least three huge adult ostriches in the poste. Araba's dog is still here. The one with the crooked tail. Last Sunday evening we ate in the yard. Mary, Dorothy (Lutz), Mrs. Bill and her children (Mr. Bill was away) and Francis Sevec (he came over to confer with Charles Hurlburt). I had a nice letter from Mrs. Grimshaw. Bumps  added a line. I'd better stop here. Lots and lots of love. Thanks for your good letters and also for your report cards with their excellent grades. 1. Bumps was the girls' nickname for Mary Grimshaw. In which Coralee reports on the Christmas program at Rethy. As I watched this program alone (Daddy was in a medical committee meeting), I relived again those I had seen in former years. It was so different not to have two little girls taking part. I missed you terribly but I am so glad you are having an opportunity to study there in the homeland. The program was in the girls dorm but no one lives there as there are even rooms vacant in the old dorm. I believe they have 25 students. It is small because of the lack of workers. Mr. & Mrs. Uhlinger  have charge of Rethi station as well as the dormitory. It seemed so strange not to find Miss Wambold , the Longmans, Camps, Trouts, Lasses, Macintoshes  and Miss Clapper and the Millers. The flowers at Miss Wambold's were lovely. I picked a bouquet of carnations from Mrs. Miller's garden. We stayed in the new rest house just beside the Miller's home. It is between the Miller and Lasse house. It has three rooms and is a neat little building. Mr. Litchman  lives in Miss Jarrod's house. He has charge of the dispensary. I'll stop here and go to the lepers. Then I'll write you an air mail. Always you are in our thoughts and prayers. 1. It is not clear why they would have gone directly to Rethy at the end of their trip instead of proceeding to Aba. But the date is firm because of the printed date on the program - the letter was written on the blank reverse of the program. 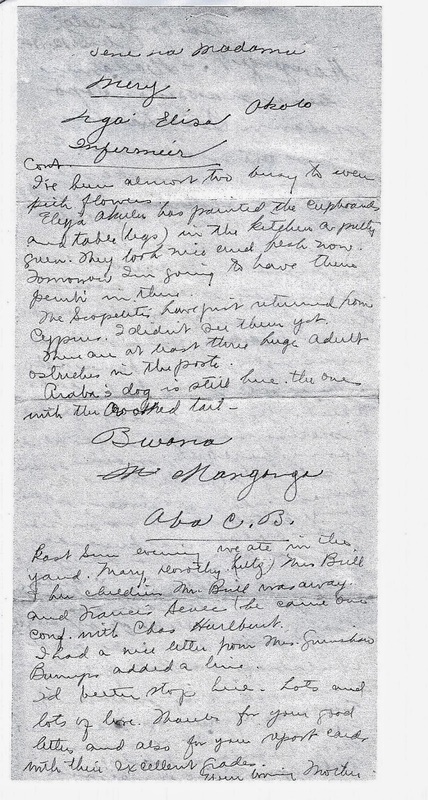 The next letter I have from Aba is dated December 16, and notes that it is the first letter from Aba. 2. Bwana Andrew Peter Uhlinger also served with the Meyers' at Oicha. Mom remembers that she and my dad learned Kingwana from Mrs. Uhlinger. 3. Burnetta Wambold. See this footnote. 4. Alan and Marjorie MacIntosh were in charge of the dormitory (the Old Dormitory). They had 4 daughters - Janet, Marjorie, Catherine (Tassie), and Myrtle. They were from Canada and were very proud of being Canadians. Mom has memories of Vespers in front of the fireplace and they also read the children stories, not just Bible stories but also other interesting stories. A special memory was of the story of Bob the cattle dog. 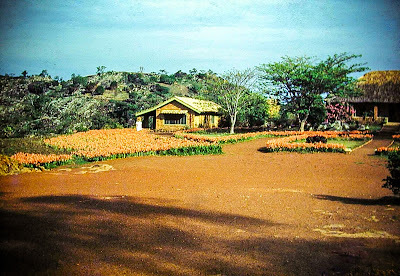 They had a small library including Amy Carmichael's books and poetry, which very much impressed Mom and began inspiring her to become a missionary. Mrs. MacIntosh was a great one for brushing hair every evening before bed. Mom remembers the big grosgrain ribbons that the girls wore to church. The daughter Marjorie attended my aunt Edith's wedding (at Lubero in 1957) and her daughter Gracie was Edith's flower girl. 5. Being at a cooler, higher elevation, Rethy could grow beautiful flowers. Miss Wambold's garden was particularly memorable according to Mom. Carnations grew very well - there were red, pink, and white varieties, and redolent of cinnamon. There were also smaller varieties. 6. Jack Litchman (known as Bwana Jack) was a single missionary, greatly loved by the local people who came to chat with him and also for counsel. He ran a little "store" with pencils, paper and other little things. A close friend of Ralph and Coralee. Mom remembers that he was engaged but that his fiance died of malaria before they were married. 7. Christmas Program notes: Miriam "Mim" Paul, daughter of Austin and Betty Paul, was a very good friend of Edith and Esther. She married Dr. Dan Fountain (his obituary here) and served as a missionary in Congo for 35 years. (Her obituary here.) James was her little brother. Fay Brill was a student, her father was Roy Brill, and the family was first stationed at Aba. (The Brills were on the ZamZam when it sank in 1941. You can read more about the sinking of the ZamZam here.) John Stauffacher was another student, son of Ray Stauffacher. 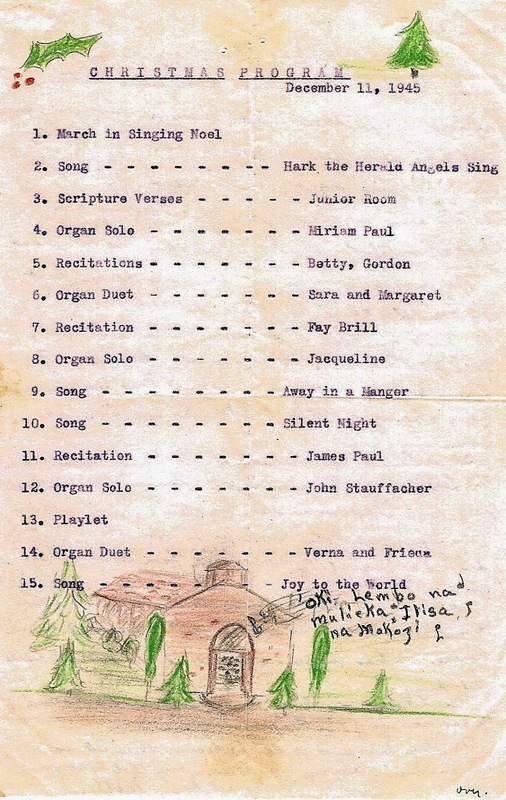 Verna Williams and Frieda Paul (Mim's older sister) did the Organ Duet listed in number 14. 8. There was a leprosy patient village walking distance from Rethy. Part of the continuing letter written to the girls during the voyage on the Gripsholm. We didn't find a way to mail the letter after all. This morning the ship came out here and anchored in the bay. Now they have posted a notice, saying we will be here at Naples a week while they repair the ship's engines. None of us are the last bit thrilled to sit here and not be allowed ashore. But we hope if possible this delay will mean the salvation of many on board. Then none of us would mind it a bit. The bay is a beautiful blue and there are large numbers of white sea gulls everywhere, really hundreds and hundreds, the most I've ever seen anywhere. We saw many damaged ships in the harbor and much evidence of damage to the buildings near the docks. Much like we've seen in pictures. The view of Naples from here is gorgeous. The buildings line the shore and creep up the sides of the hill sand two fair sized mountains. Each has a castle on top. We can see a number of historic old castles or forts among the buildings. The view of Vesuvius crater is lovely this afternoon. We've thought of you as we have looked at all these interesting things as we know you'd have found them very interesting. But I'm glad you have such a nice home and so many so many interesting things there in Zellwood. Some day you will travel again. I'll leave this note here and add more later if we don't find a way to mail it to you. In which Ralph tells his daughters about travel in Egypt, and illustrates the methods of drawing water for irrigation. Well here we are at last, really on the Nile Steamer with the next stop Juba! When in Cairo we wondered whether we would find a place on this boat or if we would have to wait at Khartoum for one or two weeks for another boat. But we learned there that the SIM people had reserved some places on this boat and would not be using them after all, and so we telegraphed to have them reserve the places for us. Pole and counterweight irrigation method. We left Cairo at 8:00PM last Monday. We had a comfortable sleeping compartment on the train. There was a beautiful clear full moon and we could see much of the landscape, first along the Nile and then in the desert. The Arab villages, with roofless or flat-roofed houses were very interesting. Later, during daylight we saw more of the Nile and we were especially interested in the irrigation systems. They had two ways of lifting water from the Nile to spill it over into the irrigation ditches. One was by means of a long pole with a counterweight on one end and a rope and skin bag at the other. Two men would pull on the pole until the bag was lowered into the water. When the bag was full they would let go and the weight would raise the water and then the men would tip it over into the channel. They would keep this up a long time and so send water all over their fields. Another way they used was by means of water wheels. These consisted of a very large wheel made of wood with clay water pots tied all around the circumference. Also around the circumference were wooden spokes like the teeth of a gear, and these mesh with similar spokes in a horizontal wheel near the ground. 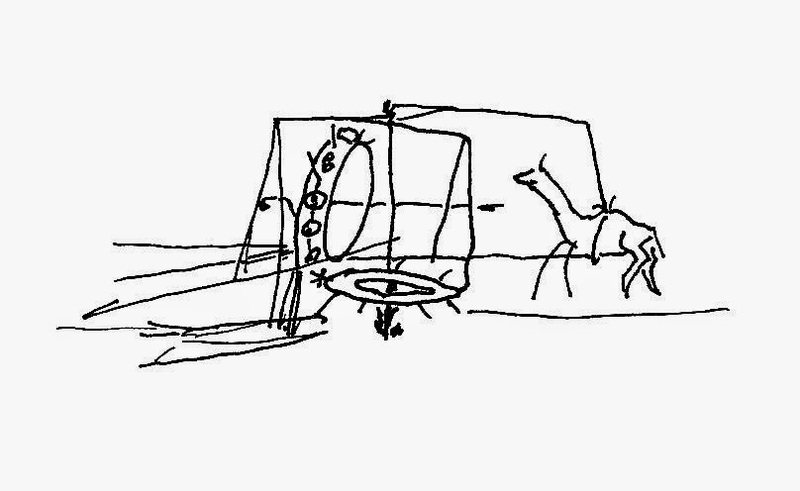 This last wheel is attached to a pole and that is pulled round and around by a camel or a donkey. The clay pots pick up water when they enter the river and when they get to the top they spill their water out into a trough that leads to the irrigation ditch. 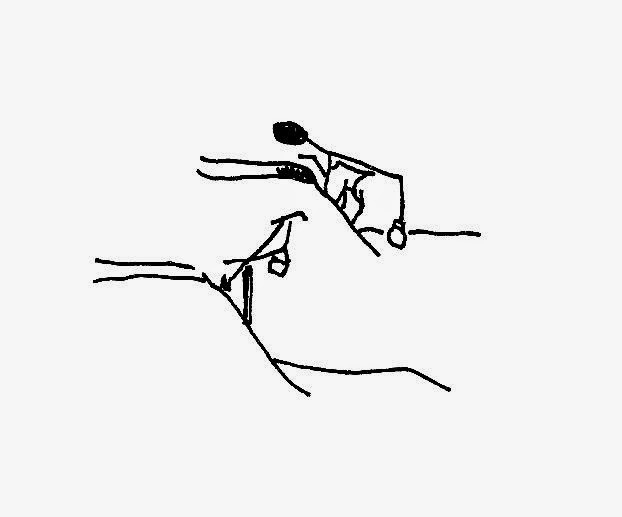 This drawing isn't quite right as the water pots must go lower to get into the water. The desert wasn't very interesting after having seen it for a while. We did see lots of camels (some baby camels too) and donkeys. Once we saw a tiny dik-dik running away from the train right out into the desert. At Assuan  we stayed in a very nice hotel and were taken on a tour to see some old Egyptian ruins which were very interesting. We went in an Arab "dhow" or sailboat and that was a lot of fun. At Wadi Halfa we took a train to Khartoum and a few hours later took another train from Khartoum to Kosti where we are now on the boat. At Khartoum we were very much surprised and pleased to meet Mr. & Mrs. Chas. Sharland of Loko and Mr. Cook of Yei, who are going along with us on the same boat . Mr. Cook you remember is the man who brought the telescope to Aba one time. Our boat is due to leave today but we have heard there is something broken and so we may not go until tomorrow. This next part of the trip should be the most interesting, I think, although the hottest. We'll write you about that later. 1. Assuan is the older spelling for Aswan. 2. This dam is the Aswan Low Dam, not to be confused with the Aswan High Dam, which was started in 1960 and completed in 1970. 3. See this post regarding Mr. and Mrs. Sharland. Note also that the spelling of "Yie" is more correctly done here as "Yei".